The BCI (Brain Computer Interface) project aims to develop compensating systems that will help people with a severe motor control disability recover mobility. The BCI project aims to demonstrate that it is possible to drive an exoskeleton thanks to an implant that records cortical signals, opening up the prospect of a better future for people with motor function disabilities. The project is based on the fact that when we imagine making a movement, we trigger the same electrical activity in the motor cortex of the brain as when we actually perform that activity. The project therefore aims to record these electrical signals, known as ElectroCorticoGrams, and decode them to drive complex objects, for example, to move the limbs of an exoskeleton. To detectthe electrical activity in the motor cortex, we needed to develop an Implantable Medical Device, the first of its kind, called WIMAGINE®. This device has been specified for minimally-invasive implantation in the cranium and, over the long term, to measure ElectroCorticoGrams thanks to an array of electrodes in contact with the dura mater. 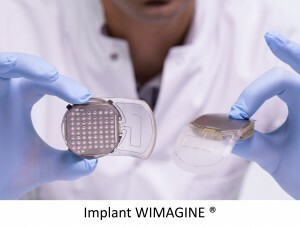 The WIMAGINE® implant has been developed within the extremely favorable technological research environment at MINATEC® for the development of innovative technological building blocks. Electronic boards contain the ElectrocorticoGram acquisition and digitization systems, designed and manufactured by the microelectronics team at CEA LETI (application-specified integrated circuit: ASIC) to record ElectroCorticoGrams, together with the remote power supply and wireless data transfer systems via secure radio link to an external base station. The implant packaging is designed to ensure long-term biocompatibility and safety. The implants have undergone rigorous testing to check their compliance with standards required by EU Directives relative to Active Implantable Medical Devices. The ElectroCorticoGrams recorded are then decoded in real time to predict the deliberate movement imagined by the subject and then, for example, control the corresponding limb of an exoskeleton. Decoding ElectroCorticoGrams required the development of highly-sophisticated algorithms able to process massive volumes of data, in real time, and ensure a good response in driving the exoskeleton. The subject placed inside the exoskeleton can drive it by imagining movements as if they were making the movement themself. 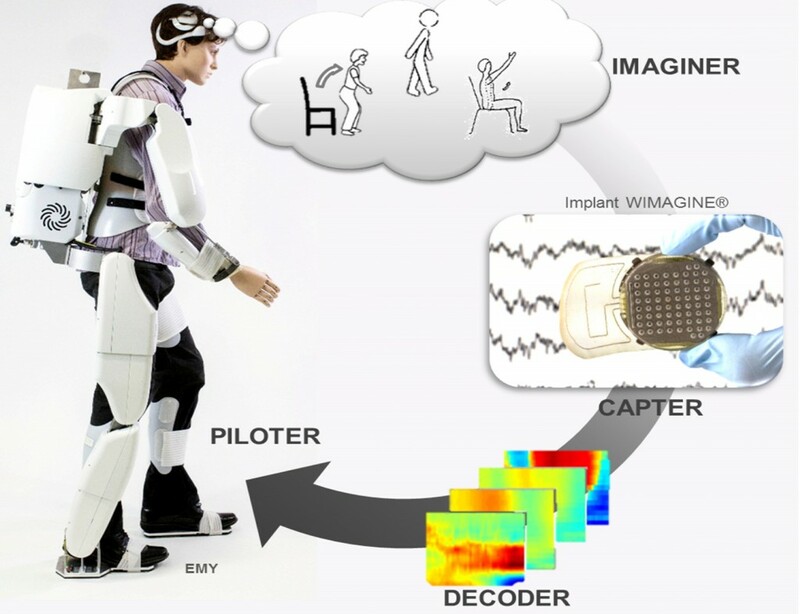 Their brain activity is recorded by the WIMAGINE® implants placed on the right and left sides of the motor cortex, and decoded to predict the deliberate movement imagined by the subject and drive the motors that control the joints in the arms and legs of the exoskeleton. At the end of 2015, Clinatec received the go-ahead from Grenoble University Hospital’s Directorate for Clinical Research and Innovation and the regulatory authorities – the French National Agency for Medicines and Health Products Safety (ANSM), and the Comité de Protection des Personnes (France’s ethical review board) – to launch a clinical trial at CLINATEC®. The protocol allows for the inclusion of five quadriplegic subjects over a period of five years. Costecalde, T., Torres-Martinez, N., Eliseyev, A., Mestais, C., Moro C., Benabid , A.L. Eliseyev, A., Auboiroux, V., Costecalde, T., Langar, L., Charvet, G., Mestais, C., Aksenova, T., Benabid, A. L.
Schaeffer, M. C., Aksenova, T.
Stable and artifact-resistant decoding of 3D hand trajectories from ECoG signals using the generalized additive model. Eliseyev, A., and Aksenova, T.
Eliseyev, T. Aksenova, C. Mestais, A.-L. Benabid, et al.